The Repercussions of Tomas D by Sam Hawksmoor is an imaginative retelling of the familiar "boy meets girl ..." story. This young adult novel gets underway with 15-year-old Tomas meeting his friend Gabriella of the last ten years in a contemporary English café. Then something odd happens. Tomas is biking home when a horrific thunderstorm engulfs him and--as if the cosmic axis shifted--he is in his hometown seventy-two years earlier in an England, suffering from the German Blitz. He has to run for the bomb shelter as an attack begins. Imagine a split-screen narration: Tomas in WWII rubble and Gabriella still in the England of 2013, but under German occupation. You see, Germany won World War II. Did Tomas do one thing--rather like the effect of that one butterfly flapping its wings in Sri Lanka--to reverse the outcome of WWII? Tomas and Gabriella can, however, still stay in touch through the modern magic of texting on their wireless smartphones, which metaphorically is like their emotion for each other: outside time and place. Hawksmoor is a vivid writer of compelling details and action. 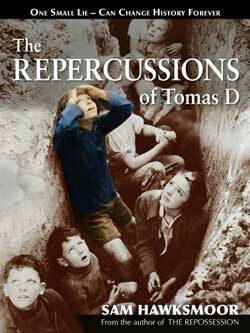 The Repercussions of Tomas D will appeal to young people who want to read what life was like in war-wracked England, pummelled by the buzz-bombs.